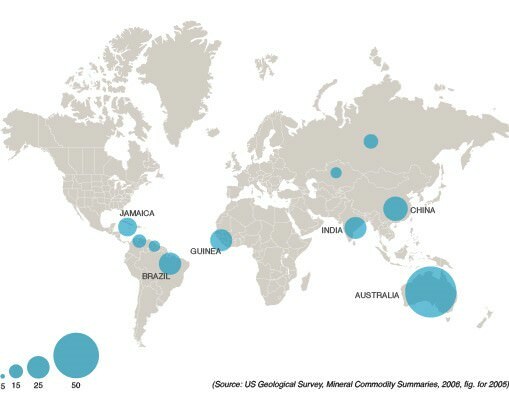 Distribution of Key Natural Resources across India and World. 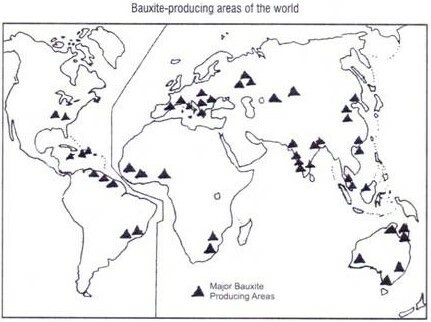 Bauxite | Lead & Zinc – Galena | Tungsten – Wolfram | Pyrites Distribution in India & World. 80 % of bauxite [ore of aluminium] ore is used for making aluminium. Found mainly as hydrated aluminium oxides. 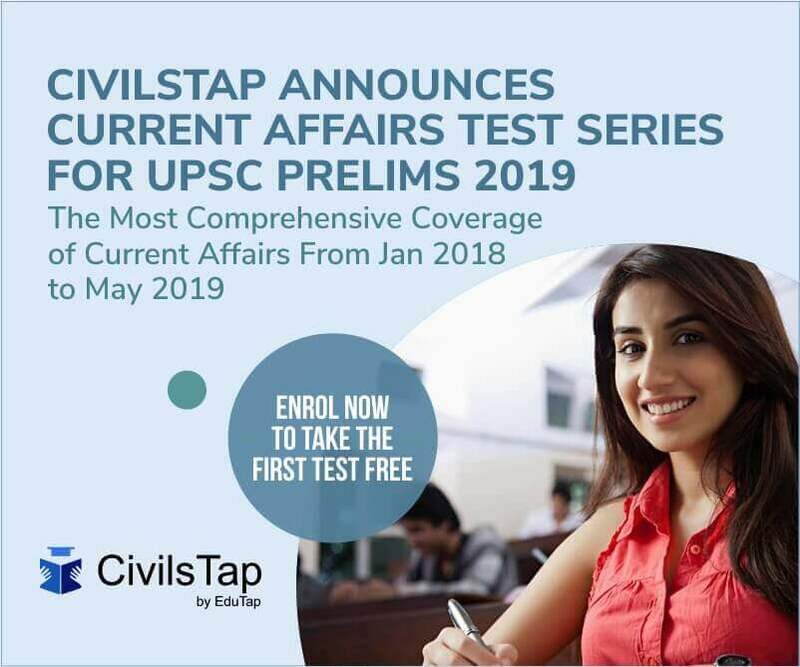 Madhya Pradesh and Jharkhand 4 per cent. 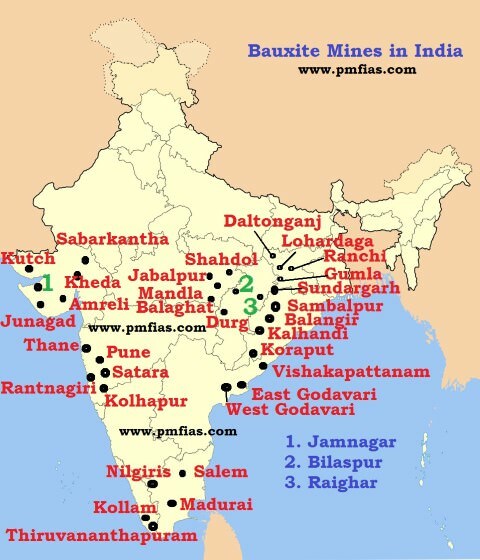 Major bauxite resources are in the east coast in Odisha and Andhra Pradesh. India manages to export small quantities of bauxite. Major importers are Italy (60%), U.K. (25%), Germany (9%) and Japan (4%). One-third of the total production of India. The main deposits occur in Kalahandi, Koraput, Sundargarh, Bolangir and Sambalpur districts. Maikala range in Bilaspur, Durg districts and the Amarkantak plateau regions of Surguja, Raigarh and Bilaspur are some of the areas having rich deposits of bauxite. Largest deposits occur in Kolhapur district. Kolhapur district contain rich deposits with alumina content 52 to 89 per cent. Other districts: Thane, Ratnagiri, Satara and Pune. Ranchi, Lohardaga, Palamu and Gumla districts. High grade ore occurs in Lohardaga. Jamnagar, Junagadh, Kheda, Kachchh, Sabarkantha, Amreli and Bhavnagar. The most important deposits occur in a belt lying between the Gulf of Kachchh and the Arabian sea through Bhavnagar, Junagadh and Amreli districts. Amarkantak plateau area, the Maikala range in Shandol, Mandla and Balaghat districts and the Kotni area of Jabalpur district are the main producers. Malleable [can be hammered into thin sheets], soft, heavy and bad conductor. Lead is a constituent in bronze alloy and is used as an anti-friction metal. Lead oxide is used in cable covers, ammunition, paints, glass making and rubber industry. It is also made into sheets, tubes and pipes which are used as sanitary fittings. It is now increasingly used in automobiles, aeroplanes, and calculating machines. Lead nitrate is used in dyeing and printing. Lead does not occur free in nature. It occurs as a cubic sulphide known as GALENA. Galena is found in veins in limestones, calcareous slates and sandstones. Zinc is a mixed ore containing lead & zinc. Zinc is found in veins in association with galena, chalcopyrites, iron pyrites and other sulphide ores. It is mainly used for alloying and for manufacturing galvanized sheets. It is also used for dry batteries, electrodes, textiles, die-casting, rubber industry and for making collapsible tubes containing drugs, pastes and the like. Maharashtra 9 (1.35 per cent). Almost the entire production comes from Rajasthan. Most important property is that of self-hardening which it imparts to steel. Over 95 per cent of the worlfram is used by the steel industry. Steel containing the requisite proportion of tungsten is mainly used in manufacturing amunitions, armour plates, heavy guns, hard cutting tools, etc. Tungsten is easily alloyed with chromium, nickel, molybdenum, titanium, etc. to yield a number of hard facing, heat and corrosion resistant alloys. It is also used for various other purposes such as electric bulb filaments, paints, ceramics, textiles, etc. Domestic requirements are met by imports. Pyrite is a sulphide of iron. High proportion of sulphur is injurious to iron. Hence is it removed and used to produce sulphur. Sulphur is very useful for making sulphuric acid which in turn is used in several industries such as fertilizer, chemicals, rayon, petroleum, steel, etc. Pyrites occur in Son Valley in Bihar, in Chitradurga and Uttar Kannada districts of Karnataka and the pyritous coal and shale of Assam coalfields. It is widely distributed and scattered across the country.